CAIRE, Justinian (1827-1897) was born on December 3, 1827 in Briançon in the French alps, the last of nine children who grew to adulthood of Jean Pierre Caire (47) and María Anna Adelaide Arduin (43). Caire was raised and educated in Briançon. In 1846 at the wish of his father, 19-year-old Justinian left his hometown to take a job working for cousins who had a hardware business just a short distance away in Genoa, Italy. In Genoa, he enrolled in a school of commerce and learned both Italian and the mercantile trade. Through fellow student Giosue Molfino he also met his future bride, Maria Cristina Molfino. By the fall of 1850, the young Caire had saved enough money to sail for California aboard Aurelie. Also aboard was 40-year-old Claude Long, with whom Caire entered business. 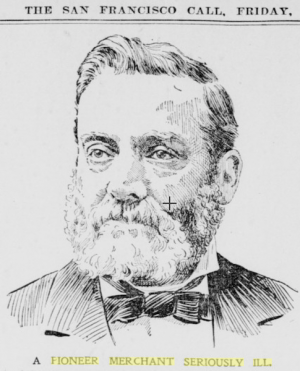 On March 29, 1851, one hundred and fifty-two days later, the 23-year-old Caire arrived in San Francisco, landing as a merchant selling French hardware and luxury goods to the booming mining community in San Francisco. Caire & Long first appeared in the 1852 San Francisco directory at 178 Washington Street. 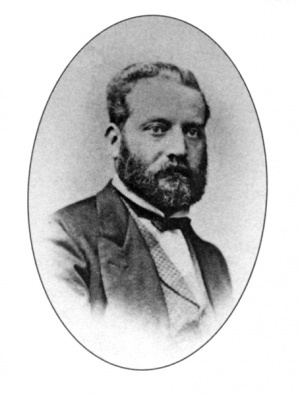 In late 1854, Caire returned to Italy to marry his Genoese fiancé, and together they returned to San Francisco via Nicaragua and the Isthmus of Tehuantepec. In 1856, Caire and Long separated, and the business became Caire Brothers, reflecting the role of Justinian Caire’s older brother in supplying merchandise from France. Justinian and Albina had nine children, six of whom survived to adulthood. 4. Amelie Apolline (1861-1917) married Pietro Carlo Rossi December 26, 1880 at St. Mary’s Church, S.F. In 1860, Caire became a director of the French Bank, and in 1869 he became one of ten original incorporators of the Santa Cruz Island Company, formed to purchase the island from William Eustace Barron. 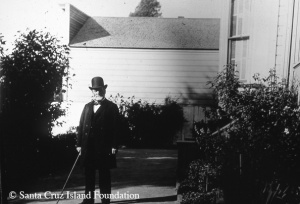 By 1880, Justinian Caire had acquired all of the stock in the Santa Cruz Island Company, becoming its sole shareholder. That same year he paid his first visit to the island and began his program of construction and development. Eight outlying ranches were created or expanded, and island operations were diversified to include viticulture and the raising of sheep and cattle. Justinian Caire left everything in his will to his wife, unconditionally. Albina Caire became the sole owner of the Justinian Caire Company and the Santa Cruz Island Company. Justinian Caire is buried in St. Mary's Cemetery, Oakland, California, along with many members of the Caire family. December 10, 1897 [SFCall]: “Oakland, December 9. Justinian Caire, who for nearly half a century has been engaged in the hardware and wirework business in San Francisco, is at the point of death at his home in this city. Mr. Caire is one of the best-known merchants of San Francisco, and he has always enjoyed first-class commercial rating. He came to the coast around the horn in 1851, and at once went into business. He opened a small hardware business and prospered from the first. His first place of business was on Washington Street, in what was at that time the commercial center of San Francisco. His business gradually grew, and he added to it the wirework business, in which he has become well known. Several years ago he moved his family to this city and has since then resided with his wife and grown-up family at Eighth and Harrison streets. About eighteen months ago Mr. Caire was stricken with paralysis, and his sons, who are with him in the business, persuaded him to retire from active work. He did so, and enjoyed moderate health until two days ago, when he was again taken suddenly ill and as contained to bed. All today he has been unconscious, and tonight Dr. Adams expected death hourly. Mr. Caire will be 70 years of age in a few days. This page was last edited on 10 June 2018, at 17:50.